1.) What sizes do the DuraMax vinyl sheds come in? 2.) What is the DuraMax shed made of? DuraMax vinyl shed walls and roof panels are made from rigid PVC material which is totally maintenance free. Additives are added to ensure the vinyl panels will not warp, bend, peel, crack or turn yellow under the sun. For extra strength the roof and wall panels are reinforced by galvanized, steel profiles. 3.) What are the advantages of vinyl sheds versus metal sheds? Vinyl is a thicker durable material that will not rust, rot or dent and never needs painting. It lasts for many years longer than metal. Metal sheds can rust and dent while wood needs repainting and can eventually rot. Vinyl requires no maintenance other than occasional spray with a garden hose. 4.) What are the DuraMax vinyl shed colors available? 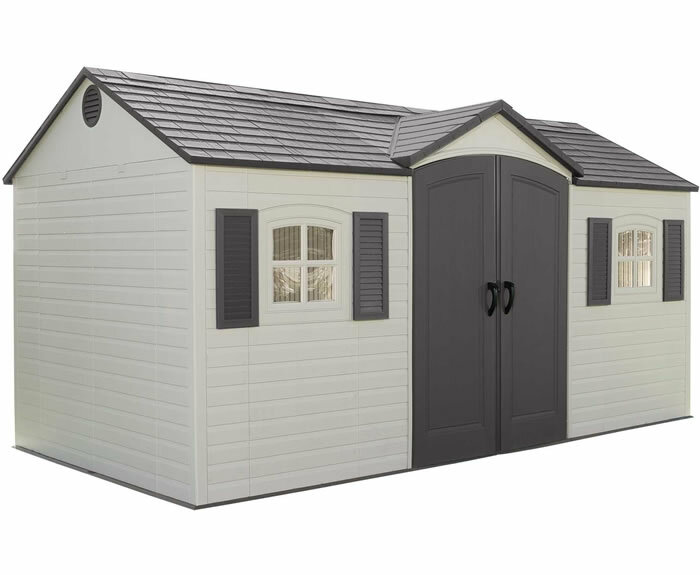 The DuraMax storage sheds come in a neutral color that is best described as ivory or eggshell. 5.) Do DuraMax sheds come with shelves or hanging hooks? DuraMax sheds do not come with shelves or hooks, but we do offer some options for you to add on to your order. Items can also be hung from the sheds column supports however care should be taken not to hang too much weight especially in heavy snow areas. 6.) Where are the vinyl sheds delivered to? Can they be sent to my home? All of our storage sheds come with free residential delivery right to your home! 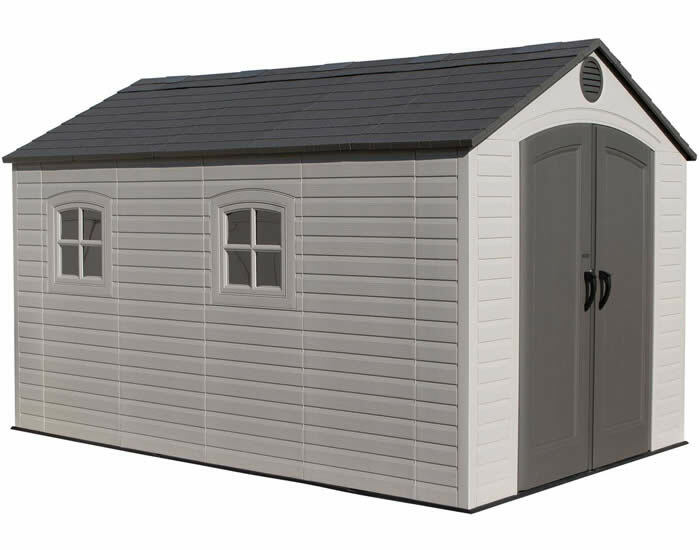 Someone 18 years or older will need to be there to sign for and take delivery of your shed. 7.) Do we assemble the storage sheds? No, we do not assemble the storage sheds. These are do-it-yourself shed kits. The customer will assemble the shed kit or hire a handy man for help. All our shed kits are very easy to assemble and come with instruction manuals written for the novice. 8.) Can I paint a vinyl shed? We do not recommend painting our vinyl sheds. If you insist on painting your shed you should use paint made specifically for PVC. However, paint will require future maintenance for you and eliminate the advantages of our durable and maintenance free DuraMax vinyl. 9.) Can I tear down the vinyl shed and build it again in a new location? You can tear down the storage shed and build again. You would need additional plugs, pins, and washers though to do so. Contact DuraMax at their toll free number 1-800-483-4674 to purchase these small parts. 10.) What do I build the storage shed on? 11.) Do any of the DuraMax vinyl sheds come with a complete floor? Yes, our 5' DuraMax Yardsaver sheds come with a complete molded floor that can sit on most surfaces including grass or soil. 12.) Can I build the new shed on an existing concrete pad? Yes, you can build our vinyl sheds on an existing concrete pad provided it's level. 13.) What is the DuraMax floor foundation kit for? What is it made of? 14.) Do DuraMax sheds have a warranty? How long is it for? DuraMax vinyl sheds have a 15 Year Limited Warranty against manufacturing defects. While the vinyl shed will not pit, corrode or yellow, the color may shift slightly based on the intensity of the sun in your location. 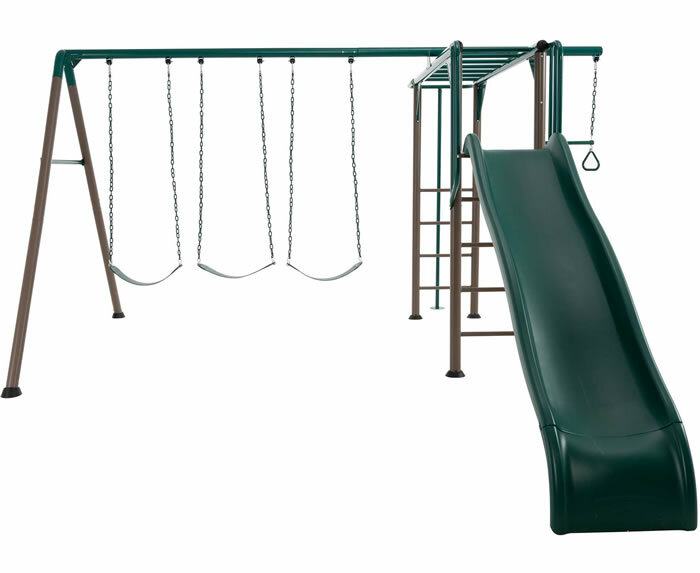 All parts are covered by the warranty and any defects will be replaced promptly. 15.) How long does it take to assemble a DuraMax storage shed? Assembly varies depending on the size of your new vinyl shed, whether you have a foundation and the number of extensions. Here are some estimates for some of our basic vinyl storage sheds: The 10x8 Woodbridge takes two people 4-5 hours, the 5x3 Yardmate takes 1 hour, the 4x8 Sidemate takes 3-4 hours; and the 8x6 Duramate takes 2 people 3-4 hours. Your choice of floor foundation and the number of extensions you wish to add to the new storage shed will add to this. 16.) Does the DuraMax shed window fit all sizes of vinyl sheds? There are two windows and one only fits the Woodbridge shed. If you choose the correct window we have one that will fit all our DuraMax sheds. You need to install the shed window in a middle panel. The panel is cut using a jig saw and the window is placed between the wall columns. Our windows slide to open and latch securely shut. 17.) How many windows can fit per shed? You can fit at least 2 windows in most of our DuraMax sheds. For each middle panel, you can have 1 window added to it. 18.) Do windows come with the DuraMax sheds? Unless we are running a free window promotion, windows are sold separately. The Vinyl Garages also come with one free window. The window lets light into the shed and when slides open to provide air circulation. 19.) Does the DuraMax shed leak? Our vinyl sheds will not leak, but after installing the roof you will need to apply silicone along the running edges of the roof ridge caps and around the washers on the roof plugs. To avoid seepage around the bottom of the new shed, apply silicone to the outside or inside of the U-channel that runs along the bottom of the storage shed. 20.) 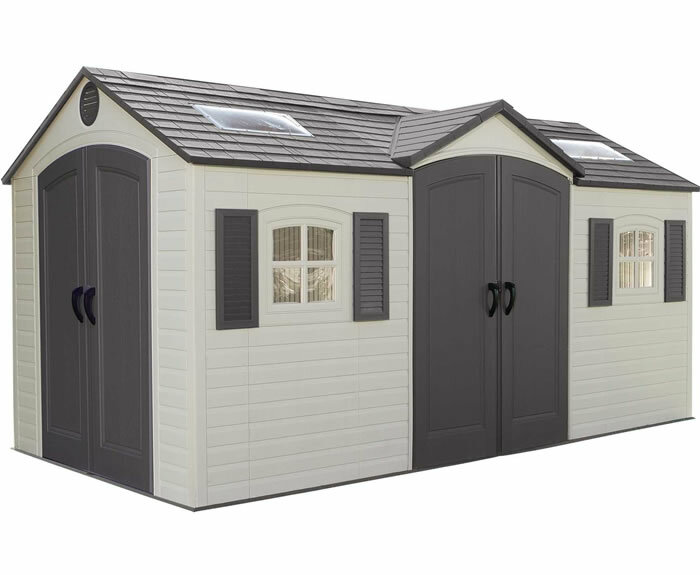 Can the 4x8 vinyl shed be setup on either side of my home? Can the door be placed on either sides of the Sidemate shed? The 4x8 Sidemate can be used as a stand alone unit in the backyard if you want. The door only fits on one side and accordingly will open in different directions based on which side of your home you install the shed. 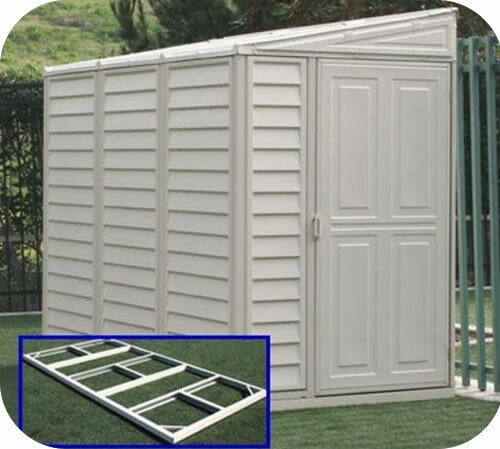 Make sure you check the opening direction of the shed door before purchasing this unit.